​At Seven Star we encourage you to look at and assess our dogs as individuals, not as a particular breed. Many of our dogs are mixed breeds, where visual guessing is not an accurate way to determine the traits and/or personality of that dog. We ask that you inquire about and meet the dog(s) to see if he/she will meet your expectations as a new family member. 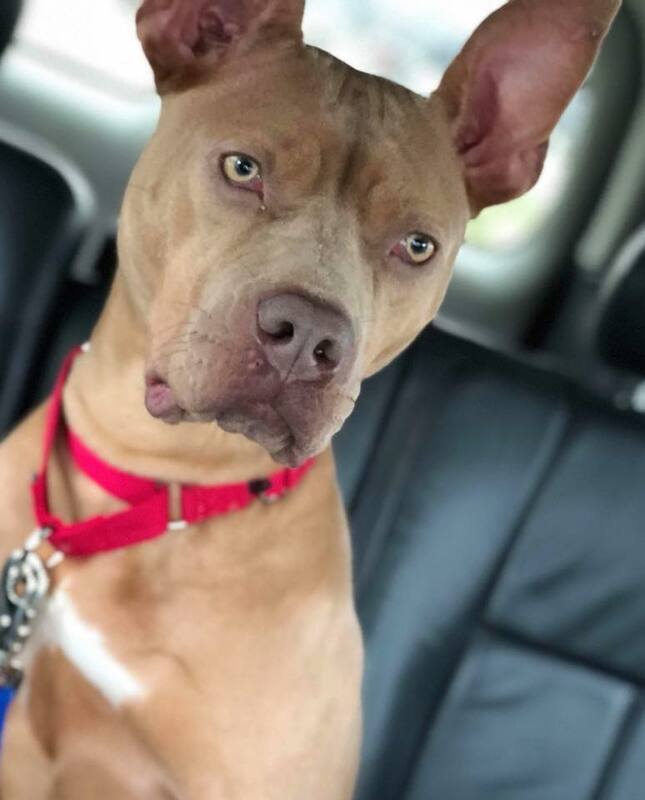 If you are interested in any of these dogs, please click on "Adoption/Foster Application" on the left navigation bar and submit an application. ​ Patch and Precious are now ready for their forever home. Patches' collar is orange and his "patch" is over his right eye. Precious' collar is pink and her "patch" is over her left eye They are about 9 months old and have been neutered/spayed and are up to date on their vaccines. They are good sized puppies and will do best with a family that will take the time to put into them for training and exercise. Patches weighs 52 lbs currently and is very laid back, though does love to play with his sister. He thinks he's a lap dog and loves to cuddle up with people. Precious is 49 lbs and is the rambunctious one. She loves toys and anyone that will play with her. Both are great with kids, though they are very large and don't realize it. Patches is very afraid of other dogs, but is okay with them if Precious is. They are doing well with potty training for the most part although Precious seems to have some separation anxiety and may go potty in her crate if crated outside normal working hours. They are a bonded pair that we would like adopted together. ​ Willow is our special needs girl as she has recently been diagnosed with Addison's Disease. Addison's is a treatable disease with a pill every day and a monthly injection. The cost for her treatment will be approximately $70.00 per month. Willow is truly a gentle giant. She doesn't realize her size, so while she crawls on your lap for snuggles or lays on you at night to sleep she's just a little larger than what she thinks she is! Willow loves being around other dogs, cats and children. She plays with her foster brothers, but mostly likes to follow them around. She mostly loves kisses and snuggling on the couch. Don't get me wrong, dog parks and running around the yard are fun too - so are exploring and digging a hole or two! Willow's perfect home is with a family - kids and dogs alike and a nice big couch. A fenced in yard with plenty of walks and dog parks would be best. Meet our little Miss Mini. She is a petite 35 to 40 lbs, is housebroken and does well with other dogs, cats are unknown. Miss Mini has been a bit stressed from shelter life so we would recommend no small children at this time. Miss Mini is spayed, up to date on vaccines, heartworm negative. You can call me "Sir"! My name used to be Tugboat, but know that I've learned me some manners and I'm a more sophisticated dude, my name is now Sir Duke! I'm a pretty good guy, they tell me. I like all kinds of people, and dogs, I'm still a little uncertain about cats. I'm housebroken, I'm neutered, I'm up to date on all my shots and I'm heartworm negative. I like walks on a leash and I'm getting pretty good at that! Just let me know when you want to meet me! Papi is a little guy with a big personality! AND he is looking for his forever home! Papi is a terrier mix, about 2 years old, he loves to sit on your lap and snuggle with you, loves to play outside! Papi is great with children and other dogs! He is up to date on vaccines, neutered, microchipped and heartworm negative. Papi is housebroken, crate trained and ready to start his new life! Sadie is a small bundle of energy and fun! She is approximately 7 years old, good with other dogs and cats and children! She does like to explore so a home with a fence would be best or Sadie! Sadie is up to date on vaccines, spayed, house broken and crate trained! Luke is an older gentleman that is looking for a family to spend his golden years with! He is about nine years old, He is neutered and housebroken, up to date on vaccines, crate trained. Luke is good with other dogs, but needs a home with no cats. 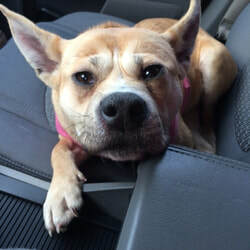 Cinnamon is about 3 years old and is spayed, up to date on vaccines and heart worm negative. Cinnamon is full of playful energy. She is a smart girl who has just learned a few basic commands. Cinnamon adores people and attention. We feel that she will do best in a home with older children. She thinks she is a lapdog and does get excited playing and may knock over a little one unintentionally. Cinnamon needs to be an only pet. If you have backyard with a privacy fence, Cinnamon is your girl!